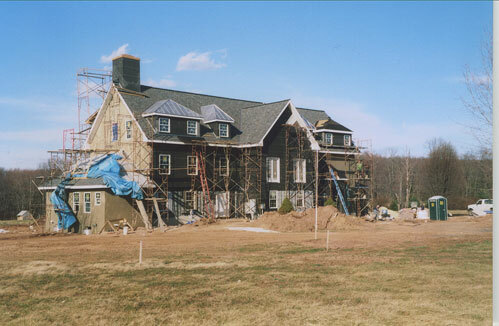 This project started as a 27 year old two story vinyl sided home which was completely gutted. The existing house was razed and only minimal framing was retained. These elements were incorporated in a 3 story French Norman residence blending classic and modern amenities which now has seven bedrooms, seven baths, three powder rooms, two and one half kitchens, library, computer den, video game room, nineteen flat screen televisions, two first floor bedroom suits, theater, billiards room and an open formal entertainment plan made this design build project the perfect home for a large family whom loves to entertain.